Wouldn't it be great if some of Gary Cee's relatives became wildly famous? 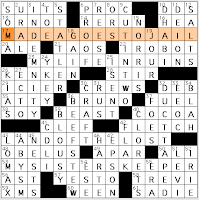 Finally, constructors could clue CEE as something other than the pretty-much-only-in-crosswords spelled-out form of the letter C. Then we need to work on finding the Ess family and spurring them to greatness. The theme is explained by SHIFT GEARS: In each of the other four theme entries, the letters of GEARS are scrambled up into non-words that are buried within longer phrases. SHIFTing GEARS could also mean that each letter would shift over one space, but that's not what happens here. The [View from the Oval Office] is the ROSE GARDEN. Hey, look! It's Popeye creator E.C. Segar, lurking on the White House lawn! CHIVAS REGAL (in which the final A could be circled instead of the other A) is a [Premium Scotch whiskey] brand. OLD-TIMERS GAME is an [Event featuring sports stars of yesteryear]; I'll take the puzzle's word for it that this is an actual thing. The final scramble is in SAUSAGE ROLL, or [Pastry sold at pizzerias]. • 50D. TOFFEE gets a weird clue: [Chewy coating for an apple]. Naw, that's caramel. TOFFEE is delightful, but I haven't ever seen a toffee apple. If I did, mind you, I would pay good money for it. Num. Toffeeeee. • 15A. [Dame who's a hoot] is Dame EDNA Everage. The most hoot-associated of all the EDNAs who show up in crosswords, for sure. • The combination of the CAT ([Litter box visitor]) and FETAL ([Like an unborn baby's position]) reminds me of these little fetuses made of polyfleece and stuffed with catnip. • 12D. Nobody loves a plural first name answer, but CARLAS goes au courant when clued as [France's Bruni-Sarkozy and others]. • 22D. The ORANGE is a [Tropicana fruit]. Technically, I'm more of a Copacabana girl. I wasn't so fond of the abbreviations (ORIG. DEPS., Athens airport code ATH, ASST. D.A., LT. GEN.) and partials (A BITE, A PAR, ARE UP) but overall, a solid Tuesday presentation. • 46A. HALLE BERRY ["Catwoman" star]. • 59A. "MEADOWLARK" LEMON [Basketball's "Clown Prince"]. He was new to me, too, but not the Harlem Globetrotters, whom he played for. "What's her problem? What's wrong with the theme?" Everybody's reasonably well-known; and yes, all of the surnames are foods—but not in any way that adds coherence to the theme as a whole. Or in any combination that sounds palatable. I kept hoping for something that would tie these disparate ingredients together, and did have a modicum of success finding recipes combining rice and bacon, e.g., or rice and lemon, or wheatberry, rice and lemon. But it shouldn't take a scavenger hunt to try to synthesize the elements of the theme. So that's my problem. That said, I did appreciate the amount of (what I see as) theme-related bonus fill. In a puzzle about food, we get [Twinge], which takes us to PANG, which leads me to think of "hunger pang." What does a hungry person do to attend to that pang? In an ideal world, s/he [Chows down]/EATS. Perhaps some BRIE [French cheese]—and shares with an AMIE [French friend]. [Then there's MAPLE clued as [Syrup flavor], conjuring up blueberry pancakes topped with maple syrup. Meadowlark Lemon comes into play once again, this time as a [Drink garnish], or PEEL. And how is all of this served up? Why, it's [Easy ___ ] AS PIE (not to be confused with AS PER [In accordance with]). Several clue/fill combos I did like include: [Winter coat? ]/SNOW (for the wordplay), [Poise]/APLOMB (because aplomb is a great word, being tied in as it is with plummet and plumb line), and [Brought forth, as a memory]/EVOKED (this combo has a nice, poetic feel). The puzzle isn't without its merits. The theme as executed today, however, simply isn't not one of them. Imoo, of course. Did you ever notice that the entry **TSUP can be completed with two permutations of the same pair of letters? 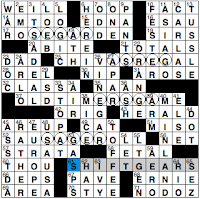 I filled in CATSUP before seeing the clue, [Acts bratty], indicating ACTS UP. • ARMY MULE is a [Military mascot]. Like its fellow lively 8s TOP-NOTCH and EATS DIRT (and the less exciting INDEBTED), ARMY MULE hooks two theme entries together. • 10-Down PASTA is a [Carbo-loader's choice] and Dr. ATKINS was the [Diet guru who wouldn't have recommended 10-Down]. Mmm, carbs. 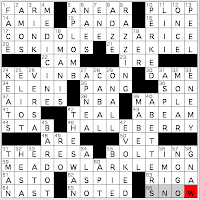 Matt Jones's Jonesin' crossword, "Mixed Reviews"
• 17A. I know there've been a few Madea movies by Tyler Perry, but MADEA GOES TO JAIL? Not ringing a bell. The clue is [Review #1: "I, a male? A good jest."]. The MADEA part was signaled by the clue (Madea is Tyler Perry in drag), but the JAIL portion? I had no idea. • 23A. [Review #2: "Filmy ennui, sir."] clues MY LIFE IN RUINS. No idea what this movie is. • 36A. [Review #3: "O, burn!"] clues BRUNO, this year's Sacha Baron Cohen movie. • 53A. [Review #5: "Re-perks, eyes mist"] relays zero information about the movie. Lemme look up MY SISTER'S KEEPER. Oh, it's that one. Tearjerker about a girl conceived to serve as a tissue donor for her ill sister. OK, the clue does provide salient information. The title made me think it was a horror movie for some reason. I see a couple dictionaries telling me that blowsy and blowzy work for 39D: [Unkempt], but BLOUSY...isn't that a casual word describing anything that blouses out like a blouse? I knew 27D: [___-1 ("Ghostbusters" vehicle)] right off the bat—my son plays the Ghostbusters video game and tells me about ECTO-1. Not a fan of the answer Y KEY. 24D is clued [You can't type "you" without it]. The Y KEY? Boo! 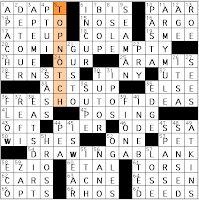 I don't want to see 25 other _KEY answers popping up in crosswords. Took me a while to summon up CLORETS, the 40D: [Breath mints brand since 1951]. No wonder: Wikipedia tells me "It is widely available in South America, the Middle East and South East Asia. The largest markets for Clorets are in Mexico, Thailand, Egypt and Japan." I haven't seen CLORETS in years.